Combine all ingredients in a bowl or bottle and whisk or shake until emulsified. Keep refrigerated until ready to use. A good vinaigrette can go a long way to transforming a dish. A very long way. Take a simple leafy green salad or some roasted vegetables, slather a little vinaigrette on them, and you’ve just elevated the enjoyability score by 100! 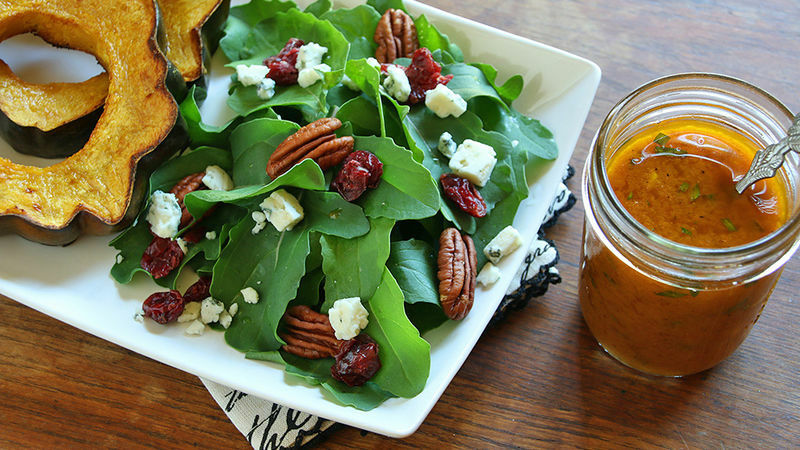 This Pumpkin Spice Vinaigrette is a prime example. With its combination of robust spices, sweet pumpkin and honey, pungent garlic and the mysterious bitter-sweet flavor of tarragon, this vinaigrette has so many layers of flavor that it will keep your taste buds dancing throughout the meal! Especially perfect on leafy green salads, including arugula, on roasted Fall root vegetables and squash, this quick and easy-to-make vinaigrette is sure to become a seasonal favorite. The best part? Making it only takes two steps! Combine all the vinaigrette ingredients in a small bowl or container and either whisk or shake until it’s emulsified. Keep refrigerated until ready to serve. For more great sauces and condiments, visit Kimberly’s food blog, The Daring Gourmet.